Cardboard Box Assembler is a brilliant concept for a browser-based video game. 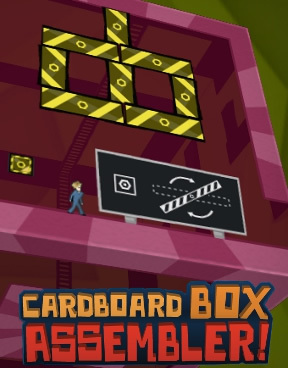 Contrary to what the title implies, CBA is primarily a three dimensional puzzler, except for one bonus level when you get to play Cardboard Box Assembler: The Arcade Game. However, that game within the game could just as easily be called, Don’t Touch the Poop. At this point, you might be thinking that I’m not making much sense. Likely, that is because CBA, for all its puzzling glory, tells the story of an insane assembly line worker named Melvin. So let’s review, CBA is a 3D puzzler wherein the gameplay is actually a blue collar factory worker tripping balls. I dare you to tell me that doesn’t sound awesome. Truth be told, the last time I had this much fun with a puzzle game I was playing Portal. CBA’s objective is quite simple. 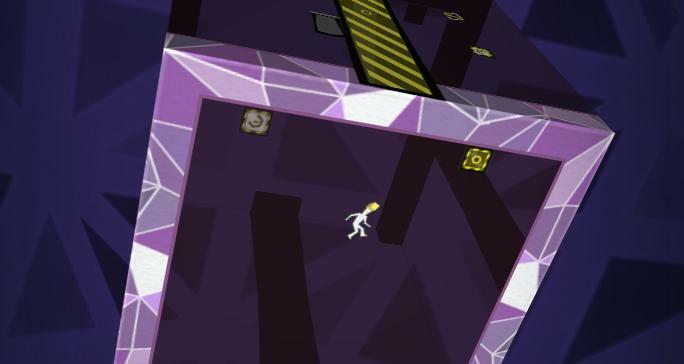 Navigate Melvin around the outside of a three-dimensional cube so that he can collect gems, find keys and open the gateway to the next cube. The trick is that as Melvin moves from one face of the cube to the next, gravity and spatial orientation shift accordingly. While the concept seems simple, keeping Melvin oriented in the right direction becomes more and more of a challenge as you progress through the game. This outstanding gameplay mechanic speaks volumes about the designers’ ability to come up with an unconventional puzzle. After completing each level or “trip” (as in bad drug trip) you are rewarded with a little cut scene that further charts Melvin’s flight to crazy town. No review of CBA would be complete without discussing the game’s opening credits. Odd as it may seem to talk about credits in browser-based game, they drew me in just as much as the gameplay itself. Mattias Gerdt’s outstanding soundtrack paired with an oddly captivating visual style to put me in a place where I didn’t simply want to play the game, I needed to play the game. Or it could just be that it reminded me of Cowboy Bebop and anything therein strikes as cool to me. Cardboard Box Assembler is a perfect example of how to make a game for the internet. In addition to being as fun as it is original, the game is actually free. I don’t have to buy credits, pirate gold or premium ingredients to get the most out of CBA. Assuming they toss in a few new puzzles and find a way to ratchet up the insanity, I would gladly toss a few dollars to Ramallo and Martínez if/when they release a downloadable version of the game. Click here to partake in the awesome.